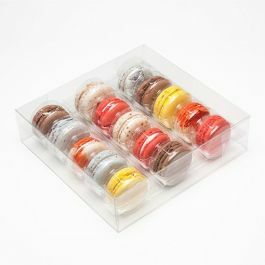 Our MBS2 French Macaron Box Set holds 10 cookies and includes an outer box that measures 5 1/16" x 2" x 7 1/2" and an insert. The inner pocket dimension of the insert is 1 1/8" x 1 15/16" making it ideal for macarons, chocolate dipped Oreos and mini donuts. Stickers are included, to purchase additional stickers click here to see our full list of sticker options. You've heard of a cookie jar. Why not a cookie box? 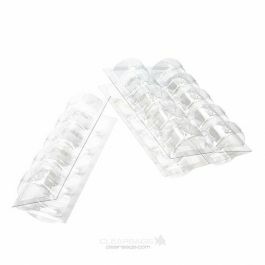 Your fancy cookies will look almost too good to eat lined up in this crystal clear packaging. The MBS2 French Macaron Box Set holds ten cookies, ideal for macarons, mini donuts and chocolate dipped cookies. 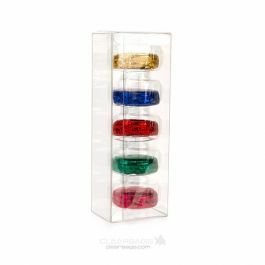 This box set includes an outer box measuring 5 1/16" x 2" x 7 1/2" and an insert. The insert includes inner pockets that measure 1 1/8" x 1 15/16." Place the top and bottom inserts together and stack inside for a colorful display of your jam-filled sandwiches. Each box comes with two clear stickers to secure your product. Outer Dimensions: 5 1/16" x 2" x 7 1/2"
The most popular use is for displaying French Macarons, chocolate dipped cookies, and mini donuts (holds 5 cookies).